46. Gregory, William King (1876-1970). 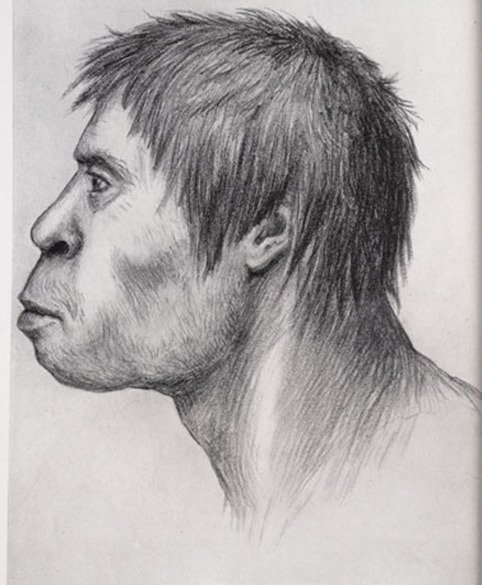 "The dawn man of Piltdown, England." American Museum Journal, 1914, 14:188-200. 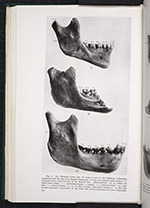 Once Piltdown man was announced in 1913, others tried to provide restorations of this new addition to the human lineage. The author of this article, W.K. Gregory, reconstructed the skull using plaster casts of the original fragments. The jaw fragment is on the other side of the reconstruction and not visible in this photograph. James H. McGregor (1872-1954) made the charcoal drawing on the right, depicting the Dawn Man as he might have appeared in life. 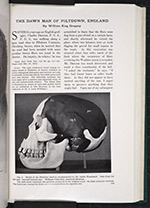 McGregor also did a sculpture of Piltdown man, which you can see on the wall panel, “Piltdown man.” Neither Gregory nor McGregor knew that the Piltdown fragments were faked, the skull pieces taken from a recent human skull and dyed to look old, while the piece of jaw actually belonged to an orangutan, and had similarly been altered to look ancient. The hoax would not be detected until 1953.